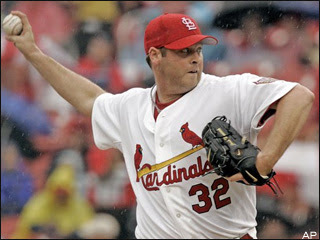 Cardinals relief pitcher Josh Hancock died in a car accident early Sunday morning. This is a terrible tragedy for a franchise that is still reeling from the death of Darryl Kile in 2002. Hancock was 29 years old. Deadspin has an excellent post about Hancock, one I highly recommend you read. Thoughts and prayers go out to his family and loved ones during this difficult time. Any comment(s) that I deem inappropriate will be deleted immediately. Thank you.